Nine year-old Hanan Mohamud is happy with her new ride. Dozens of newcomer youth have new bikes – and a newfound sense of independence – thanks to The WRENCH. “For a lot of kids having a bike is way to have some freedom to explore their new homes, to hang out with their new friends, to be able to get out into the community and do things with their family,” says Benita Kliewer, WRENCH’s Program Coordinator. WRENCH, which stands for Winnipeg Repair Education and Cycling Hub, is a charitable community bike shop that aims to promote cycling and make bikes accessible to everyone. One of the ways it does this is by hosting drop-in days where people can repair their own bikes or learn to build a bike from scratch – even if they have no experience. “Lots of people say ‘Well, I’ve never worked on a bike. I have no idea how to do this.’ That’s no problem. We’ll pair them up with an experienced mechanic, set them up with a set of tools and then walk them through doing whatever needs to get done. It’s a really an empowering experience,” Ms. Kliewer says. 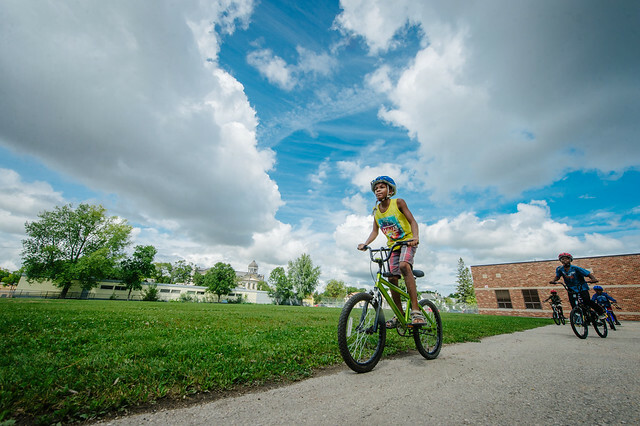 This summer, WRENCH’s Newcomer Bike Initiative offered several programs specifically to support some of Winnipeg’s newest residents. One of the many events was a Bike Bazaar held in conjunction with the Immigrant and Refugee Community Organization of Manitoba (IRCOM). On a sunny summer day in mid-August, kids and their families gathered in the yard of Victoria Albert School. Dozens got new bikes and helmets, including Musu Kayfay’s two children, Mohamed Sessay and Fatumata Kayfay. The family came to Canada via Guinea about a year and a half ago. “Before [the kids did] not have a bike like this. They were bugging me, [saying] they need a bike… [But] I don’t have possibility for them to get a bike. When [IRCOM staff] told me they would give bikes away here I said, ‘That’s nice. I will come,’” Ms. Kayfay says. These programs, offered in conjunction with local schools and organizations, allow kids as young as eight to learn how to build and fix bikes, and even earn their own bike through volunteering. “Bikes are very accessible machines so it’s really possible for everyone to learn,” Ms. Kliewer says. WRENCH also offers programs targeted specifically to girls in Grades 7 and 8. “We do essentially a stripped down earn-a-bike with these kids. It’s a way for them to learn mechanical skills which they may not have had chance to experience thus far in their life. And a way to also mentor them in some way to know what it’s like to be a woman growing up in Canada,” Ms. Kliewer says. Last summer, WRENCH received a donation of bike trailers from MEC, so it held a trailer building workshop and is partnering with Hospitality House Refugee Ministry to give them away to newcomer families. “It’s a way to keep the families together and allow folks to experience their new home together,” Ms. Kliewer says. WRENCH has also been working to translate a number of documents including one outlining the names of key bicycle parts. “When you’re trying to use the specific technical [words] in a new language, then everything gets a little bit more complicated. It’s helpful to have things to point to with different translations,” Ms. Kliewer says. To learn more about WRENCH and how you can get involved, go to thewrench.ca. The WRENCH’s Newcomer Bike Initiative received a grant of $24,500 drawn from the Gray Family Fund, a Donor-Advised Fund. These are some photos of The WRENCH's bazaar held in conjunction with the Immigrant and Refugee Community Organization of Manitoba (IRCOM) at Victoria Albert School, in August 2016.